Theo Duff-Grant began dancing at seven years old. Now at eighteen, he is about to make the transition from student to professional. I sat down with Theo over skype to discuss his thoughts on his training in Vancouver and what has led to his current success. L: What inspired you to become a dancer? T: My sister started dancing before I did and my Mom and I would go to pick her up from classes where I would watch her in the studio which led me to decide that I wanted to try it too. L: So then how did you get into dance yourself from watching your sister? L: Where did you start dancing? L: Through your training in ballet do you feel that your experience has been different being a male that it would’ve been if you were female? T: Yes it was very different because almost anywhere I went I was the only boy in the class or in a competition so for example at competitions people would always assume that I would win because I was a boy and only to encourage me to continue dancing. L: What is something you are continuing to work on to improve as a dancer? T: This year I have been trying to focus more on opening up my facial expressions in my performance, not just while performing on stage but also in class. I think that it’s important because a lot of the time we can be so focused on the technical aspects of dance and forget that the most important part is the interpretation and the artistry of it and so I’m trying to focus more on that and trying to be not so closed in and to project more, especially during classes. L: So then what are you doing to improve that? Are you working with your teachers? T: Well my teachers do talk to me about it but I have to work on it mostly on my own. I have to work on not just thinking about stretching my legs and pointing my feet but also trying to remember my face and opening up more, not just thinking about the technique. L: So aside from what you’re working on in your training, what is your favourite part of your profession? Or just your favourite part of dancing in general? T: I really like working in the studio, I know a lot of people love performing more but I love working on a piece or just working in the studio and then slowly seeing everything come together and improve, especially near the end when you really see a dance begin to take shape, I think that’s the most exciting part. L: You were recently hired by the Dutch National Junior Company congratulations! Can you describe your audition process? T: Well it was kind of a strange way to join the company because usually when there is someone from the school that they want in the company they will just ask them since the director comes to our performances and watches some of our classes so usually they’ll just ask right after seeing them. The first time that they did ask me I didn’t feel that it was the right time for me so I declined, and then when the open audition for the company was happening the artistic director asked my teacher if I was going to be there and I said that I would because I felt that it would be a good time to enter the company. So I went and there were about 130 people auditioning that had been selected from about 650 applicants, they saw us in class in two groups and then asked to speak with a few of us afterwards. L: You mentioned that the first time you were offered a position you didn’t want to take it, what changed the second time you were offered it? T: Well I should say that they didn’t exactly offer it to me, but they asked if I was interested in a position. The reason they did was that someone in the company had been injured in November and they were going to be unable to dance so they needed someone to fill his place. I would have needed to start right away in January and I just felt that I really needed to finish off the year until June to complete my training fully because I didn’t feel that I was ready to join a company. L: You seem to be very focused on your training, what do you think is the most important aspect of your training? T: As I said before, now I’m trying to work more on my presentation and my artistry because I think in earlier stages of your training you’re just focusing on the technique and then when you get older, people expect to see a real artist when you enter a company and not just a technician. I’m also trying to focus on the different repertoire that we work on which is very important because I think that prepares you for working in a company when you’re working on a bunch of different pieces. L: So do you think you’ve improved with your performance ability since you’ve started working on it? T: My teachers have said that I have improved a little on it but I think it’s a very big process and takes time to develop, I’ve only just started. 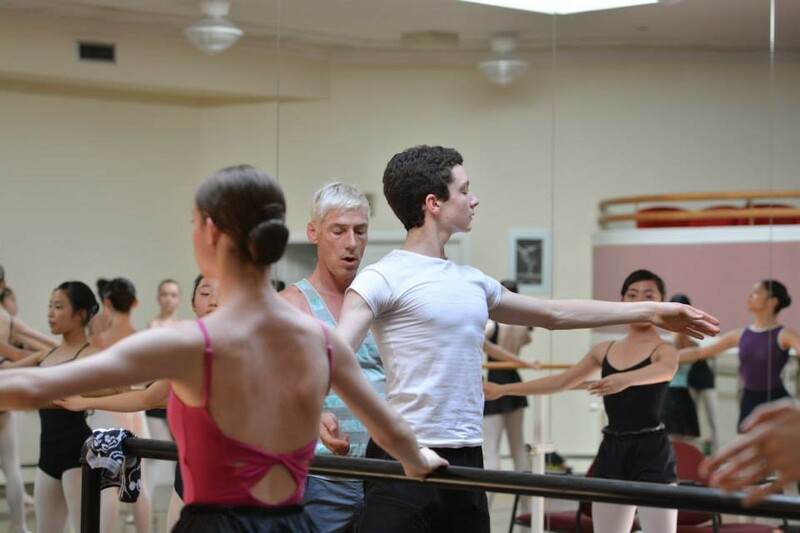 L: Other than ballet, do you have any non-dance interests that affect your training and your career? T: I really like Pilates and different methods of cross training have been very effective, in the last few years I’ve really gotten into strength training at the gym, as well as going swimming I think that really helps and I can feel a difference in my dancing, especially for pas de deux work. L: Who is one of your greatest influences as an artist or someone that you look up to? T: Two of my favourite dancers are David Hallberg and Alina Cojocaru, I think the two of them have found a really great balance between their artistic abilities as well as the amazing technique that they both have. I really look up to both of them. L: What is your greatest aspiration as a dancer? T: I’ve always wanted to be a part of the Royal Ballet in London, but I think aside from just being a part of a company, I also really want to develop more into an artist like one of the dancers that I mentioned before. I think I would love to be part of a company like the Royal Ballet but no matter where I end up I really want to become a dancer that I would want to be. L: What does that mean for you? T: With Alina and David, they found such a nice balance between their technical and artistic abilities, nowadays people can be so focused on only the technical side and I’d like to find a good balance between both. L: Last question, after you’re finished performing in a company what would be your next step? Do you want to stay in dance or do you want to do something else? T: I think it would be really strange to just stop dancing so I definitely would like to keep dancing as much as possible, but maybe not performing as much so teaching at a company, or working as a coach for students I think would be really great.